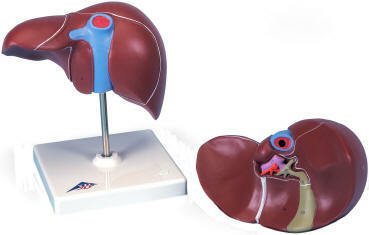 This deluxe model is one and half times life-size. 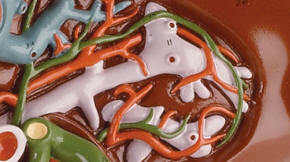 The ventral surface of is dissected to expose major blood vessels and bile ducts in deep relief. 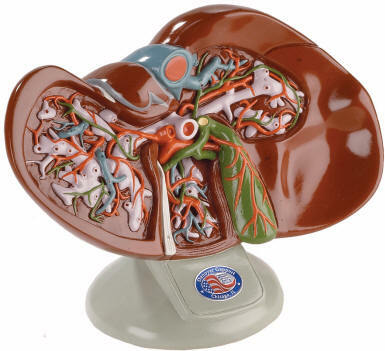 Color-coding clarifies the complex vascular network, with contrasting colors differentiating the portal vein and its branches, the gallbladder and bile ducts, the hepatic artery and the hepatic veins. 28 hand numbered structures are identified in the accompanying key. 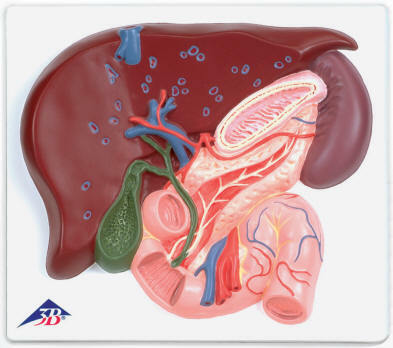 Full size liver model shows conditions such as: Cirrhosis (septal and nodular), biliary obstruction, gallstones and tumors. 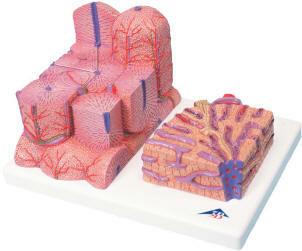 Model Size: 8" x 4-1/2" x 5-1/2"
This outstanding liver relief model shows the liver with: ducts, gall bladder, pancreas, duodenum, vessels, extra-hepatic ducts with gall bladder, main pancreatic duct and their orifices. Everything is mounted on a baseboard. 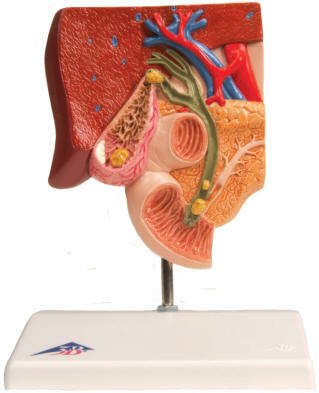 This graphic gallstone model for patient education shows the anatomy of the biliary system and its surroundings in half natural size. 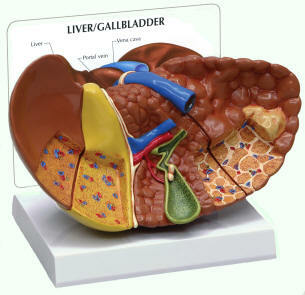 Both acute inflammation (cholecystitis) and the tissue changes caused by chronic inflammation can be identified in the gallbladder wall. Gallstones can be found in the following typical locations: (1) in the fundus area of the gall bladder, (2) in the area of the spiral valve, (3) in the area of the common bile duct and (4) in the papillary opening to the small intestine. 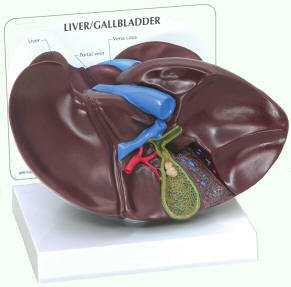 The Gallstone model comes mounted on base.